College graduates attend their commencement ceremony in May 2017, Los Angeles, California. The opportunity to ensure strong student outcomes in postsecondary education exists—accreditors just have to be willing to take it. The good press coverage followed a new effort announced by the Council of Regional Accrediting Commissions (C-RAC)—an informal group of seven accreditors that oversees colleges in defined geographic regions. The group announced a plan to take a closer look at institutions with low graduation rates in late 2016. Under the plan, C-RAC members conducted an in-depth review of four-year colleges with graduation rates at or below 25 percent and two-year colleges with graduation rates at or below 15 percent, which is about half the national average.4 The review looked at conditions that may explain the low graduation rates and what colleges were doing to improve, although it did not lead to any immediate sanctions on those schools. The reality of how accreditors use student outcome data actually lies somewhere in between. This report shows that the common refrain—that accreditors don’t focus on student outcomes—is only half true. Accreditors do much more than measure inputs such as the number of books in a library, which they have long been criticized for doing instead of measuring student outcomes. Most accreditors collect numerous outcome measures every year. It is unclear, however, the extent to which the data are used to hold colleges accountable for bad outcomes. As a result, accreditors may review student outcomes, but their standards lack clarity on how a school’s observed performance connects to consequences. With no definition of what performance means in terms of a college’s quality, even the lowest performers pass the bar. These primary findings cover regional accreditors; national accreditors will be addressed later in the report. 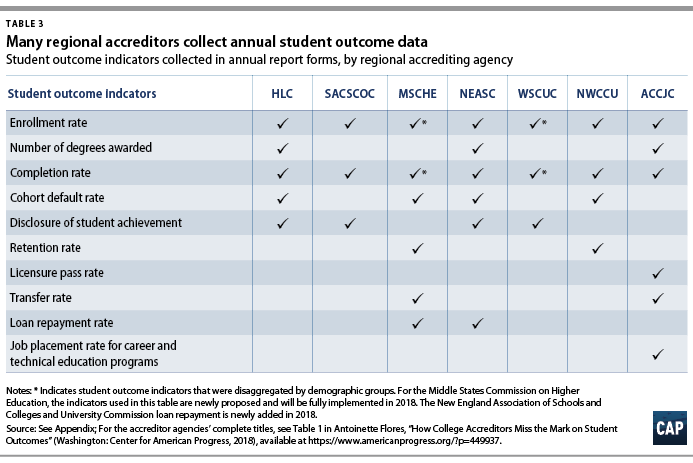 The Center for American Progress conducted a detailed investigation of accreditor policies and practices at 11 main regional and national agencies, reviewing standards, guidance, documents, and annual reports to identify to what extent accreditors hold colleges accountable for student outcomes. The analysis also looked at how standards and guidance are used in practice. For each of the seven regional accreditors, the author reviewed documents for two colleges’ accreditation reviews. Examining these documents showed what evidence colleges provide to prove that they are meeting accreditors’ standards as well as how agencies then evaluate whether or not a college is in compliance. A similar review of self-studies from nationally accredited institutions could not be completed because nationally accredited colleges do not typically make these reviews public. Regional agencies vary in terms of what student outcomes they emphasize, but none have a clear definition for what constitutes poor performance or how observed results connect to accountability actions taken. Some agency policies require that institutions evaluate specific outcomes such as completion in their accreditation reviews. Other agencies leave it up to the institution to determine which outcome measures demonstrate the value of the education they offer. The primary focus of regional agencies, however, is not on the level of performance but rather on the process a given college has to improve its educational offerings. As a result, a school’s success is often measured by whether it has a codified process—not whether its performance is any good. Consequently, low performers may be insufficiently pushed to improve. In contrast, the policies of national accreditors—which oversee mostly career-focused programs—place a clearer focus on accountability for student outcomes in their reviews. These agencies have minimum performance requirements for outcomes such as completion, job placement, and licensure pass rates. These measures are typically assessed annually, and often down to the individual program level. This structure, however, may not be as strong as it appears. When an institution fails to meet a benchmark, some agencies can be lenient in enforcement. Minimum performance standards may not represent high bars and vary across agencies. In practice, similar colleges are held to divergent expectations by national accreditors on how their students fare. The good news of this analysis is that many regional and national accrediting agencies already collect some of the student outcome measures and have in place a process for collecting data needed to adopt a more results-based approach. That said, getting all accreditors to such a place demands a sizeable mentality shift to an approach that would require defining adequate performance and establishing a process of accountability across agencies. Changes to federal legislation could help encourage this shift. Collect common student outcome data across agencies. Include equity in data collection. Connect data collected explicitly to standards through clear performance benchmarks. Establish a defined process in accreditor standards for holding colleges accountable when performance on student outcome benchmarks is not up to standard. Support the creation of a federal student-level data system. Require accreditors to have standards on defined student outcomes. Create repayment rate and default minimums for federal aid purposes. Requiring accreditors to focus more on outcomes matters for students. Each year, the U.S. Department of Education provides nearly $130 billion in taxpayer money in the form of student grants and loans to help 13 million students attend more than 6,000 colleges.7 Many of these students, however, will never graduate. Students who do not finish are significantly more likely to default on their student loans, often with catastrophic long-term financial impacts.8 To make matters worse, the higher education system suffers from broad gaps in college attainment and disparities in student loan debt and default by race and income.9 These differences define a system that too often exacerbates inequity instead of serving as an engine for economic mobility. It is all too easy for a college whose students don’t fare well to receive an accreditor’s stamp of approval—and the federal money that comes with it—over and over again, even when student outcomes don’t improve. While C-RAC’s review of graduation rates is a great first step to encouraging higher accreditor standards, it will not amount to accountability unless it goes beyond simply reviewing institutions. Instead, accreditors must implement a set policy and process to address low performance on student outcomes going forward. Accrediting agencies are nonprofit, independent membership associations that serve as gatekeepers to federal student aid dollars. Before students can access federal grants and loans to pay for college, their college must first gain approval from a federally recognized accrediting agency. The U.S. Department of Education recognizes 36 accrediting agencies of three different types.10 The first group consists of seven main regional accreditors that oversee schools based on their geographic location. For example, the Southern Association of Colleges and Schools Commission on Colleges (SACSCOC) oversees colleges in the southern states.11 The majority of colleges overseen by regional accreditors are public and private nonprofit colleges. The second group consists of national accrediting agencies that oversee colleges nationwide, most of which are private for-profit colleges. The third group—which is not detailed in this report—consists of programmatic accreditors that oversee specific programs but are not typically the primary gatekeepers to federal financial aid. To gain approval from an accrediting agency, colleges must prove that they are in compliance with their agency’s standards at least once every 10 years—and timeframes at national accreditors are often shorter. A grant of accreditation after the review process should signal that a college is high quality. An accreditor must abide by several federal requirements to serve as a gatekeeper to federal financial aid dollars. Under federal law, accrediting agencies are required to have standards on student achievement in addition to other categories such as faculty and finances.12 Accreditors set their own standards on quality that colleges must meet in order to be accredited. Standards, as used here, are the framework an accreditor uses to evaluate a college. Third, each accreditor sets its own standards on quality, which can vary significantly by agency. Though the requirements outlined in law do not define student outcomes standards, they also do not restrict agencies from setting and creating their own stricter accreditation standards for their institutions. Standards: Standards are the quality framework an accreditor uses to evaluate a college. The standards define rules a college must meet in order to be accredited. Accrediting agencies create their own standards. While standards vary across agencies, federal law requires agencies to have standards in key areas such as student achievement, faculty, and finances. Self-study: A self-study is a report each college must prepare that explains how it meets its accreditor’s standards of quality. Accreditor site visit or team report: Accreditor site visits or team reports are put together by a group of volunteer peer reviewers in order to evaluate whether a college meets an accreditor’s standards. They often explain where a college performs well, where it falls short, and what it needs to do to improve. These reports are based on information provided in a college’s self-study and found during an accrediting team’s visit. Student outcome standard: A student outcome standard is based on quantifiable student achievement measures such as graduation rates, employment rates, and student loan defaults. Under federal legislation, accreditors are required to have standards on student achievement—which may include student outcomes, but is not specifically defined. This report is only concerned with student achievement standards that address student outcomes as defined here. 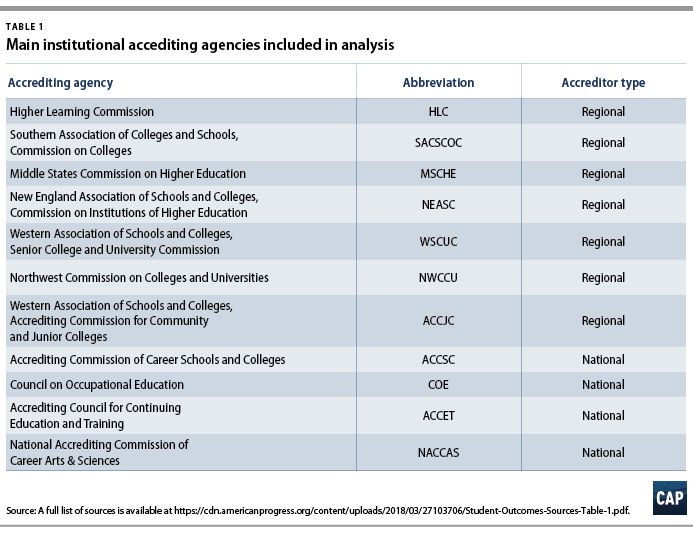 To understand how accreditors use student outcome data in college reviews, CAP analyzed documents from the seven largest regional accrediting agencies and four of the largest national agencies. Table 1 provides a complete list of the accreditors included in this analysis as well as their respective abbreviations. This analysis relied on a wide range of documents. The author examined accreditor standards to determine how colleges are evaluated on student achievement and what requirements a college must meet to gain accreditation. This report also included a review of any publicly available guidance provided to institutions on what evidence should be included in the self-study. Accreditors typically have broad definitions of student achievement, including student learning, graduation rates, and postgraduation placement. This report, however, only analyzes standards on quantifiable student achievement measures such as graduation rates, employment, and student loan defaults. While learning is a critical part of student achievement, it cannot be easily quantified and is complex enough to merit its own report. Due to their broad definitions, standards can often be vague and difficult to understand without real-world context. To better grasp how standards are applied, this analysis included a review of several college self-studies as well as the accrediting site visit team reports that followed. While a site visit team report is not the final say on whether a college meets agency standards, it does heavily influence an agency’s final decision. Institutions have the opportunity to respond to the report, and the agency’s commission determines whether an institution meets each standard. It is important to note, however, that these decision processes are not public and are influenced by the findings from the site visit report. CAP reviewed a total of 14 colleges’ self-studies and subsequent accreditor site visit team reports—two colleges for each of the seven largest regional accrediting agencies. Nationally accredited colleges do not voluntarily make accreditation documents public, therefore, a similar review of these colleges’ self-studies could not be completed. Reviewing two examples of accreditation reviews for each regional agency is by no means comprehensive of all the work an agency does, but it can provide additional context for how reviews apply standards. Because self-studies and site visit reports are not always public, CAP applied several selection criteria to its review. CAP only reviewed colleges that published both their self-study and their corresponding site visit team report. A self-study on its own only provides information on how a college believes it meets an accreditor’s standards, not how an accreditor judges a college’s performance. This analysis also attempted to only include self-studies and reports that were conducted based on each agency’s most recent standards. This was impossible to do for some agencies due to a recent change in their standards or their lack of transparency. For example, the NEASC revised its standards in 2016.20 Of the 28 U.S. colleges that underwent reviews by NEASC in 2016 and 2017, only two colleges—Johnson State College and the University of Massachusetts, Boston—published both their self-studies and accreditor site visit reports. However, University of Massachusetts, Boston was evaluated based on NEASC’s 2011 standards. In another example, MSCHE revised its standards in 2014, but the standards only became effective for colleges undergoing review in the 2017-2018 school year.21 Because no colleges had completed a self-study or accreditation visit based on the new standards, CAP used the old standards for this portion of its analysis.22 A complete list of accreditor standards, self-studies, accreditor site visit team reports, and other relevant guidance reviewed for this report is included in the Appendix. Additionally, CAP attempted to review self-studies from a broad range of colleges in order to include examples from a variety of institutions. The two self-studies for each regional agency, for example, typically consisted of one large and one small college; one public and one nonprofit college; or one four-year and one community college. Lastly, CAP reviewed the instructions for annual reporting required by accreditors as well as the forms and submissions when available. Each agency requires colleges to submit annual reports consisting of a range of financial and student outcome data. These reports provide additional information about the types of evidence accrediting agencies have available to evaluate college quality. If a report was not publicly available, CAP reached out to the agency for more information. Overall, this analysis found that the expectations regional accreditors lay out in their standards on student outcomes vary widely. Some agencies require colleges to focus on specific measures; some require goal setting on particular outcomes; and others allow institutions to decide measures that accurately reflect their success. The following table shows how student outcome standards compare across agencies. A full list of each agency’s student outcome standards is included in the Appendix. To read the accreditor agencies’ standards in Table 2, hover over the check marks. Five of the 7 agencies included in this analysis require colleges to set goals on student performance. ACCJC, for example, has the most detailed standards on institution-set goals and requires colleges to set their own performance expectations.28 The agency requires that institutions set performance goals on course completion rates, the number of degrees awarded, transfer rates, as well as job placement rates and licensure pass rates for every career and technical education program. 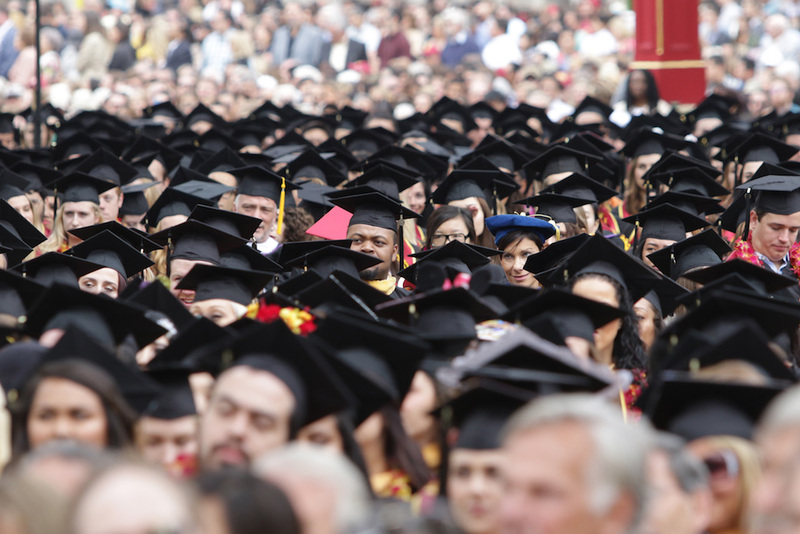 Colleges are also required to set standards of performance on other measures they deem appropriate to their mission, such as graduation and retention rates. As part of colleges’ self-studies, they must explain how they set the standard, how they evaluate their previous performance, and how their performance compares to their goal. ACCJC’s method presents an alternative to national accreditors’ minimum performance standards. Rather than set one bar all institutions must meet, the agency takes an individualized approach that requires each college to set its own benchmarks for acceptable performance. Unlike other regional agencies’, ACCJC’s standards exemplify institutional flexibility that does not come at the expense of accountability. However, goal setting also has an inherent tension. On the one hand, goal setting ensures that colleges strive for improvement. On the other hand, even colleges with the worst performance get by without requiring further action. Overall, goal setting allows institutions to determine what level of success is appropriate based on their own unique contexts. While accreditors evaluate institutions’ goals, they never define a minimum bar of performance that is acceptable for all institutions. In practice, some of these goals act more like minimum performance thresholds rather than goals to strive toward. At MiraCosta College, for example, some institution-set standards are below actual achievement.29 A system that requires colleges to choose their own performance categories also makes it harder to compare performance consistently across colleges. Only 2 of the 7 regional accrediting agencies have standards that are focused on equity in outcomes. Both WSCUC and ACCJC require institutions to disaggregate and analyze performance data by demographic categories.30 WSCUC requires institutions to disaggregate student data by demographic categories and areas of study, and ACCJC requires institutions to disaggregate and analyze learning and achievement outcomes by subpopulation. When an institution identifies a performance gap, it must provide resources to address and fix the gap and must evaluate the effectiveness of its strategies to do so. Standards that focus on equity are important because they require that institutions go beyond overall performance indicators to ensure that they are serving all students well. Without a coordinated effort across agencies, however, colleges can miss some of the important gaps that occur within and across institutions. A review of required annual reporting forms shows that regional accreditors already collect data on numerous student outcome indicators each year. (see Appendix) This undercuts the common assumption and criticism of accreditors that they don’t measure performance on even the most basic outcomes such as graduation rates. Table 3 shows which student outcome indicators are collected by each regional agency in annually filed forms. Without linking long-term data collection to standards, accreditors are unable to hold colleges accountable for what the data may show. Accreditors can only take action against an institution if it violates one or more of their standards. Therefore, how colleges perform on these measures does not directly factor into whether or not it should be accredited. As part of its annual report, HLC has begun flagging colleges with weak graduation and persistence rates compared with their peers for follow-up.38 The agency flags institutions that fall in the top percentages of the institutions’ peers for further follow-up. Peers are defined as two-year small or large institutions or four-year small or large institutions. It is unclear what the follow-up consists of; how many institutions fall within this category; or whether the follow-up leads to further action. Annual data collection processes mean that regional accreditors already have much of the necessary information and infrastructure in place to enhance their focus on student outcomes. But just because accreditors have the data does not mean they will use it to drive accountability. Accreditors need to decide what level of performance is adequate and what actions they will take when an institution is not up to par. Aligning annual reports and standards would allow accreditors to set strong student outcome standards and collect data annually to hold institutions accountable. Without this connection and a history of data, accreditor standards fall short of actual accountability. A review of self-studies and accreditor team reports shows that even when an institution is reporting data, its actual performance on those measures can still be overlooked. As a result, accreditors and institutions may produce a great deal of documentation about how schools use and report data while never discussing what the data actually demonstrate in terms of results. A few examples show how this phenomenon plays out in practice. Self-studies and site visit team reports can gloss over a long list of student outcome measures to prioritize improvement rather than accountability. NEASC, for example, requires institutions to include Data First forms as the basis of their self-study.41 These forms include data on a wide range of institutional characteristics and student outcomes such as student debt levels and rates of enrollment, retention, graduation, licensure passage, job placement, and default over several years. NEASC standards require that “[t]he institution demonstrates its effectiveness by ensuring satisfactory levels of student achievement on mission-appropriate student outcomes.”42 Standards, however, do not define what level of performance is satisfactory. Without a clear definition, a college can meet a standard—even when, by its own admission, its performance is unsatisfactory. The NEASC site visit team report acknowledged JSC’s low performance but found its focus on improvement satisfactory.46 It first mentioned the graduation and retention rates the college provided and noted that they were one set of indicators the college used to monitor effectiveness. It then acknowledged that these rates were lower than other Vermont colleges’, but that JSC recognized its need for improvement. The report stated that the college had considerably higher graduation rates for Pell Grant students and first-generation college students. Furthermore, the report highlighted a promising initiative the college instituted—themed first-year learning communities—which were slowly improving first-year retention rates. At the end of the report, the visiting team listed the college’s strengths and weaknesses. Among its strengths were JSC’s commitment to student success and its investment in the first-year experience, both of which have improved retention. The site visit team did not mention anything related to student outcomes in its list of JSC’s weaknesses, nor did it have any recommendations on how the school could improve.47 In other words, according to the visiting team report, JSC’s efforts to improve its persistently low graduation rates were sufficient, despite that there had been little measurable improvement. Whether or not an accreditor’s standards include specific student outcome measures that must be examined does not appear to create a greater focus on performance. SACSCOC, HLC, and ACCJC’s standards on student outcomes vary considerably in terms of their specificity. ACCJC requires specific, institution-set performance goals; HLC requires a focus on particular outcomes; and SACSCOC leaves performance up to institutions. Examples from each agency, however, show that all suffer from similar shortcomings. While ACCJC’s approach is valuable and data-focused, it glosses over student outcomes without judging the college’s performance or need for improvement. It allows low-performing colleges to meet the standards as long as they set goals, strive to achieve them, and implement improvements. The gap between data collection and data use among regional accreditors has significant implications for students. Without a baseline standard for performance or improvement, accreditors likely end up measuring institutions’ intentions and processes—not the actual results they achieved. In contrast to regional accreditors, the four national accreditation agencies have clear, quantifiable standards on student outcomes. These agencies’ standards require institutions to meet minimum bars of performance each year based on various measures. Three of the 4 agencies require institutions to report outcomes at the program level. The one exception, NACCAS, primarily oversees cosmetology schools, so although it doesn’t explicitly measure program-level outcomes, the colleges it oversees are typically singular programs.57 Monitoring performance at the program level allows accreditors to further review or sanction individual programs rather than limit their examination to the institution as a whole. While clear performance benchmarks ensure a minimum bar of quality that institutions must meet, they are only worthwhile if the thresholds are ambitious and catch the worst performers. 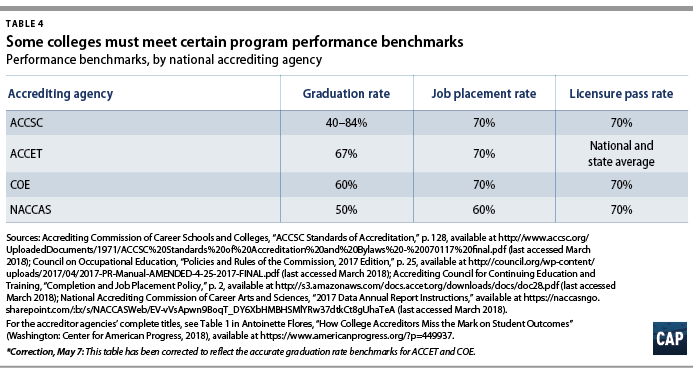 Variation in performance benchmarks means that institutional quality and the likelihood of success potentially depend on which accreditor oversees the school students attend. It also matters how an agency sets its benchmarks. ACCSC, for example, sets its thresholds one standard deviation below the average performance among its institutions.61 This assumes that average performance is adequate. But if an established benchmark is set low enough that an overwhelming majority of institutions or programs pass, it does nothing to encourage improvement. Performance benchmarks set a clear line of what outcomes are acceptable, but the actions an agency takes when a college is underperforming can undermine accountability. The procedures described above show that institutions are given considerable leeway and can remain accredited—even if they don’t meet minimum performance benchmarks. How often accreditors accept alternative responses or measures—as well as how long colleges remain accredited despite poor performance—is unclear, since information on when a college underperforms and the accreditors’ decision process is typically not public. Without greater transparency on outcomes and sanctions, it is difficult to determine the effectiveness of these policies. Unlike regional agencies, national accreditors connect student outcomes directly to their standards and annual reporting requirements. Figure 5 shows that all four agencies track outcomes based on the performance benchmarks required in the agency standards. Collecting this information in annual reports ensures that colleges are meeting performance benchmarks each year—not just once every several years. National agencies are also more likely to require institutions to report annually on red flags, such as whether or not the college is under investigation. Figure 5 shows what accreditors require institutions to include in their annual report. Three of the 4 national agencies ask institutions whether they have had any kind of negative audit at the state and federal level. Both ACCSC and ACCET require institutions to report on actions taken by other accreditors, complaints, and investigations. 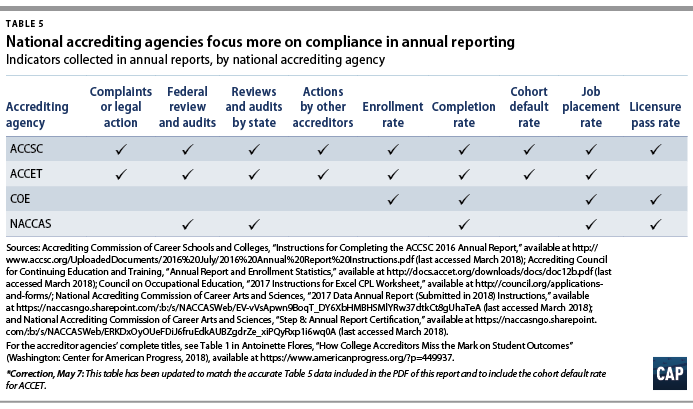 Part of why national accreditors are more likely to include compliance on annual reporting might have to do with the types of institutions these agencies oversee. National agencies mostly oversee for-profit colleges that historically have had more troublesome track records with cases of fraud than have public and private nonprofit colleges. Explicitly asking this information every year ensures that problematic institutions don’t slip through the cracks. As gatekeepers to federal student aid, accrediting agencies have a responsibility to ensure that institutions are high-quality in order to protect both students and taxpayers. CAP’s review shows that, particularly among regional agencies, accreditors’ lack of clear standards for student outcomes means that institutional performance is not sufficiently emphasized. There is no minimum student outcome result institutions must meet in order to be accredited, nor does low observed performance consistently trigger further examination. The result is that accredited institutions can easily fail their students. National agencies’ clear performance standards and annual data collection processes do more to hold colleges accountable, but agencies are inconsistent and, in many cases, soft on enforcement. Fortunately, CAP’s review also shows that accreditors have an annual data collection process in place and already possess some of the data required to enhance their focus on outcomes. In order to fix these problems, there must be a stronger tie between data collection and standards. Below are recommendations for how accreditors can improve and hold colleges accountable. Variation in accreditors’ measurements and in established bars of performance undermines agencies’ goals of quality and accountability. Under the current system, an institution overseen by one agency must report one set of data, and an institution overseen by a different agency reports another set of data. The variation in what data is collected makes evaluating overall performance and drawing comparisons across institutions difficult. Accreditors should agree upon what student outcome data to collect as a standard measure of quality across all agencies. Similar to the work done as part of the C-RAC pilot, both regional and national agencies should decide together what data to collect and how to report it. This may require measures to differ based on institution type or mission, because outcomes for career-focused institutions or programs may not necessarily be the same as outcomes for liberal arts-focused institutions. Accreditors may also agree that community colleges and four-year colleges should be judged based on different measures. Furthermore, accreditors need multiple indicators that capture how students fare while they are enrolled—such as retention and completion rates—and after they’ve left—such as job placement rates and student loan repayment. Accreditors should also create a definition of each measure so that agencies can collect data in the same way. For example, while each of the national agencies consistently collect data on completion, job placement, and licensure pass rates, their definitions of each measure varies. Variation makes it difficult to compare performance across institutions. Regional agencies have all attempted to place a greater emphasis on completion rates through the C-RAC study but all found that the federal graduation rate does not accurately depict outcomes consistently across colleges.69 Regional agencies can and should come up with their own measures to best capture student outcomes. Measuring institutions’ overall performance is not enough. Accreditors should require institutions to disaggregate performance data by demographic groups including, at least, race, income, and gender—and ideally attendance status and students requiring developmental education as well. These measures are important to ensure institutions are achieving equitable outcomes for all students. Only two agencies require colleges to look at outcomes by demographics—such as race and income—to evaluate performance. WSCUC and ACCJC’s standards that require colleges to disaggregate data represent great starting points for other agencies.70 However, even these standards—which allow colleges to choose which measures and demographics they disaggregate—leave too much up to each college’s discretion. Accreditors already have the foundations of an annual reporting process and years of student outcome data in place to enhance their reviews, but it’s not always clear how this information is factored into accreditation reviews and decisions. Agencies should revise their standards to articulate clear performance expectations. This does not necessarily mean accreditors should have a bright-line standard that automatically leads to a loss of federal financial aid when a school falls short. Instead, accreditors could create a standard that automatically triggers an in-depth review or a shortened accreditation cycle. Benchmarks should be established for measures beyond completion rates, such as loan default and repayment. Performance benchmarks can be designed to accomplish multiple goals by focusing attention on the lowest performers while also setting improvement goals for all institutions. Accreditors should ensure that annually collected data feed into what schools will be measured against and need to discuss in their self-studies. This connection to standards also must ensure that accreditor reviews touch on the observed performance level—not just on the process and use of data. Connecting these processes ensures that when a college is judged against the standards, the judgment is grounded in years of performance data. It also guarantees that colleges are held accountable for a basic level of performance and improvement every year—not just when it is reaccredited. Establishing expectations for student outcomes that are connected to standards must be paired with instituting clearer processes for actions agencies should take if an institution’s student outcomes fail to meet a benchmark performance level. Accreditors must agree on what happens to colleges that fall below established benchmarks and define a consistent timeline for colleges to show improvement. Measuring student outcomes and establishing benchmarks is meaningless without accountability for institutions that consistently fail to perform and fail to improve. Action must go beyond interim reporting, shortened accreditation cycles, and special visits—tactics accreditors sometimes use when colleges show serious problems. Creating a federal student-level data system (SLDS) would make it much easier for accreditors to collect and use disaggregated student outcome data. An SLDS would allow all institutions to report detailed data at the individual student level to the federal government rather than at the institution-wide level. Colleges currently report dozens of data elements ranging from enrollment and graduation rates to revenue and spending under federal law.71 They then provide substantial data to accreditors that may or may not line up with required federal reporting. This setup presents two main challenges. First, current data systems may not produce indicators that are useful for institutions or accreditors. Until October 2017, the federal graduation rate only included first-time, full-time students, excluding those who transferred or enrolled as part-time students.72 Accreditors and institutions criticized this measure as a poor judge of institutional performance, which has weakened their ability to use it.73 Second, the need to report data to both the federal government and accreditors creates a greater burden for institutions. A federal student-level data system would capture more accurate and complete student outcome data and decrease both the burden on colleges reporting data and the need for low-resourced accreditors to actively collect it. Congress has the power to make legislative changes that would require accreditors to focus more on outcomes in a clear and consistent way. To do this, Congress should take the following steps. Current legislation requires accreditors to have standards on student achievement but does not define student achievement, which leaves it open to interpretation. It also gives colleges the authority to define success based on their institutional mission, so that successful student achievement can vary by individual school. While some variation based on unique institutional missions is important, there should be a baseline level of student outcome performance required in order for colleges to access federal dollars. Legislation should define which student outcomes accreditors should have standards on, such as graduation rates, student loan repayment, and default. These standards should clearly define the adequate level of performance as well as the agency’s process when performance is not up to par. Federal reviews of accreditors should consider variation in the standards accreditors set to ensure that all are using best practices. National agencies, for example, set performance benchmarks that vary widely, and federal reviews only consider whether the agency has a standard—not whether the standard is adequate. Accreditors should be held accountable to ensure that their standards are adequate and in line with other agencies’. As gatekeepers to federal aid dollars, accrediting agencies must ensure that colleges are providing a quality education and that America’s higher education system is truly a generator of social and economic mobility. This report shows that, for the majority of accreditors, student outcomes are not a main priority and equity is mostly an afterthought. While the recent effort of C-RAC was a critical first step to addressing poor student outcomes, it does not amount to accountability. Fortunately, there is a path to fixing this problem. Actually doing so, however, will require building performance on student outcomes into accreditor standards. The lack of true accountability means accreditors avoid engaging with the poorest outcomes and fail to help institutions improve how well they serve students in a tangible way. For regional accreditors, change means implementing minimum performance indicators that trigger meaningful action and require improvement. For national accreditors, improvement means ensuring benchmarks are strong and taking action against low-performing colleges instead of giving them additional chances. The opportunity to ensure strong student outcomes in postsecondary education exists—accreditors just have to be willing to take it. *Correction, May 7: This report was updated to reflect that ACCET commissioners may make an exception for underperformance if a program has a low completion rate but a higher-than-average job placement rate. Antoinette Flores is an associate director for Postsecondary Education Policy at the Center for American Progress. Her work focuses on improving quality assurance, access, and affordability in higher education. The author would like to thank Mary Ellen Petrisko, former president of WSCUC, and Dr. Susan Phillips, professor at the State University at Albany and former chair and current member of the National Advisory Committee on Institutional Quality and Integrity, for providing expert feedback.